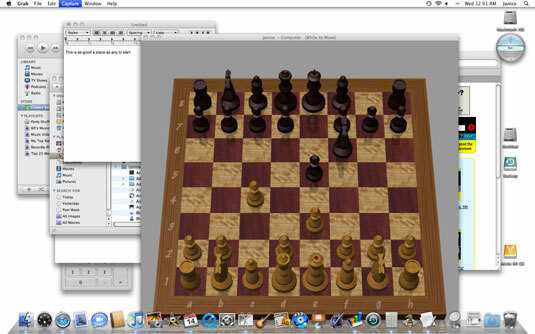 Your Mac desktop can get cluttered, especially as you juggle several projects at once. Fortunately, Apple lets you clean up your Mac desktop with Exposé. To access Exposé, simply press your F9 key (or the Fn+F9 combination on some models or F3 on Apple’s new aluminum keyboard). When you hit the appropriate function key, each previously open but obstructed window emerges from its hiding place. Exposé proportionately and simultaneously downsizes all windows so that you can temporarily see them all at once. If you move the cursor over one of the visible windows, you see the title of the application or folder, and the window appears dimmed. Point to the window you want to bring to the front (to work on) and press the spacebar, press Enter, or click inside the window. F10 (or Control+F3 on the new keyboard): Opens all the windows in the application you’re currently using. If you’re working on a document in Microsoft Word, for example, any other open documents in Word will also be brought to the front lines. 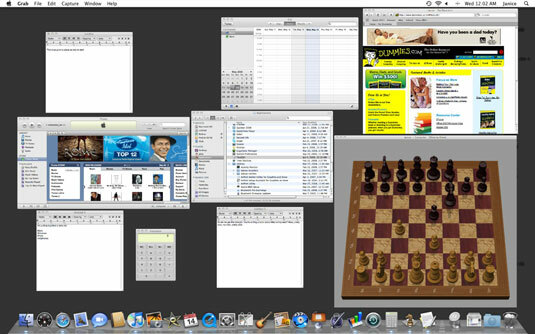 F11 (or Command +F3 on the new keyboard): Hides all windows so that you can see your desktop. If you don’t like using F9, F10, and F11 (or other keys you’re using for Exposé), open System Preferences, choose Exposé & Spaces, and assign alternative keys. And if you don’t like using the keyboard in general, you can arrange to have Exposé do the cleaning by moving the cursor to one of the four corners of the screen.